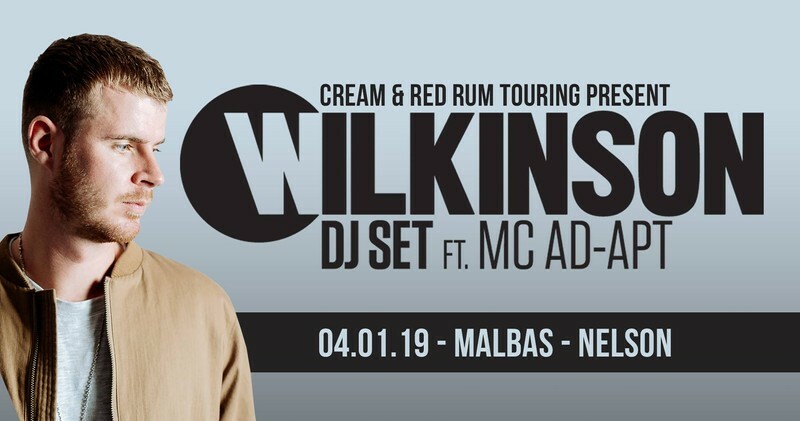 Cream & Red Rum Touring are proud to present: Wilkinson DJ Set FT. MC AD-APT. Support from: Ben Walker aka Benny Boy, The Beat Mafia (AKL), RYDR (CHCH), Acen (CHCH) & local support. Hailing from the leafy suburbs of South West London is Ram Records’ Wilkinson. His first insight into making music came aged of 9 when his parents bought him a drum kit. Mark ‘Wilkinson’ joined a few bands playing at venues as far as the Birmingham NEC and as close as the local old peoples home. This swiftly ended at the age of 14 when Wilkinson discovered his passion for dance music. In his final year at college he tried his hand at making beats, leading him to buy his first bits of production gear and turning his bedroom into a studio. A few years and part time jobs later, after driving his family mad with large amounts of bass loosening the brickwork of his house, Mark secured himself a studio not far from his home. After fine-tuning his production skills, Wilkinson passed a few songs on to Hospital Records via Cyantific, which led to his first release on Hospital's ’Sick Music 2 compilation. A few months later he sent a folder of tunes to Ram Records and within days received a phone call from Andy C inviting him for a meeting at the Ram HQ. Fast forward a few years later and Wilkinson, now signed to Ram Records/Virgin EMI is being touted as one of the most successful stars in dance music. Following his club anthems 'Tonight', 'Take You Higher’, ‘Need To Know’, 'Heartbeat and 'Too Close' and ‘Hit The Floor’ Wilkinson released 'Half Light' charting #20, Dirty Love which peaked at #10, ‘Hopelessly Coping’ peaking at #23 on the UK Top 40 and ‘Afterglow’ which became a top 5 hit on the UK Chart, selling 500,000 copies with 65 million Youtube views. To date he's sold a mighty 1.1 million singles. His debut album 'Lazers Not Included' went to number 1 on the iTunes Dance Chart in 10 countries and his tour schedule takes him across the globe performing everywhere from Radio 1 Big Weekend, Glastonbury, Wireless, SW4, Reading & Leeds, EDC Vegas and 2018 will see Wilkinson embark on is 4th summer residency at Amnesia, Ibiza. He gone on to build a fierce live reputation with his band over the last 4 years, selling out London's Electric, The Forum and Roundhouse and his last 4 UK Live tours not to mention headlining festival stages around the globe. Having remixed and collaborated with the likes of Ed Sheeran, Chase & Status, Wretch 32, Katy B, Laura Mvula and Becky Hill, he's scooped ‘Best Single’, ‘Best Album’, ‘Best Video’, ‘Best Producer’ and ‘Best Live Act' at the National Drum & Bass Awards, not to mention the VEVO Viewers Award at the MVA’s.